This Cahoots review was made after playing the game about 25 times. We were provided a copy of this game by the publisher in exchange for an honest review. 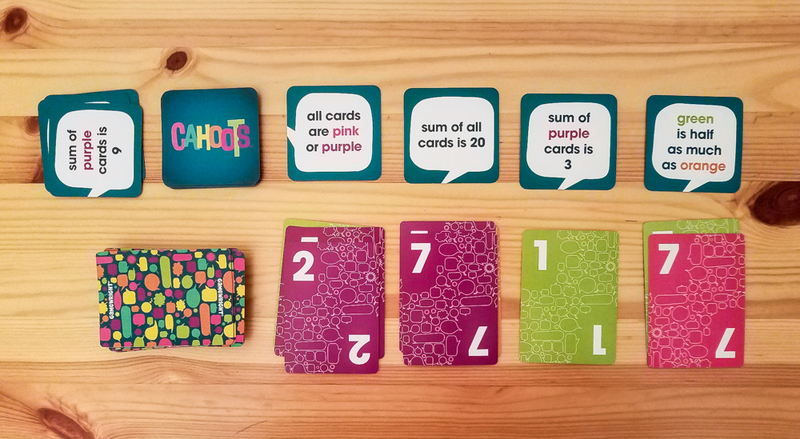 Cahoots is a limited communication cooperative card game in which you’re attempting to complete a series of goals by matching colors and numbers. The game was designed by Ken Gruhl and is published by Gamewright. There are two decks of cards in Cahoots: the number cards and the goal cards. You’ll make a deck of goal cards based on how difficult you want the game to be; for example, you’d use 18 of the 50 goal cards if you want to play at Normal difficulty in a two or three-player game. To complete setup, you’ll place four number cards on the table and the first four goal cards above them. If you’re lucky, one or more of those four initial goals will be completed before anyone even plays a card. On your turn, you play one number card to one of the four piles on the table. Your card has to match a pile’s number and/or color. If you complete one or more goals, you’ll place those goal cards aside and draw new goal cards. After you’ve placed your card and completed any goals, you’ll draw back up to four cards. This is a limited communication game, so there are limits to what you can say to your teammates. You can’t talk to them about the cards in your hand, but you can tell them about any goals that you’re going for or piles that’d you’d like to play to on your next turn. You’ll win the game if you’re able to complete all of the goals. You’ll lose if you run out of number cards or if a player can’t legally play on their turn. It seems like everyone in my group enjoys most restricted communication co-op games like this. In Cahoots, it adds in that extra bit of tension as people hope that you don’t ruin their plans while simultaneously hoping that you complete some goals. Changing the difficulty level is extremely simple. You just add or subtract goal cards. It’s very easy to find the perfect challenge for your group. The replayability of Cahoots is pretty high. The goal deck will always be different so you really can’t predict what’s coming next. I’ve already played it about 25 times and the last game I played was just as entertaining as the early games. To me, Cahoots is equally solid at all player counts. I could see some people arguing that it’s better with more players because you get a bit more chaos with multiple people wanting to “reserve” piles, but I don’t find it better at any one player count. Just about anyone can learn how to play Cahoots in a couple of minutes. I actually had a chance to teach it to a bunch of new gamers and they got it in no time. The game can end pretty quickly if a player gets a bad hand of cards and has nothing to play. It doesn’t happen often, but it’s a bit of a bummer when it does. It’s kind of a shame that Cahoots lacks a theme. That doesn’t ruin it by any means, but giving it some type of theme—even code-breaking or bomb-defusing—might have taken it to the next level. Quite a few people mixed up the pink and purple cards during our games. Considering only four colors are used in the game, I’m surprised they didn’t replace one of those two colors with something else. I’m not sure the speech bubble artwork makes sense for this game. It does look nice, though. 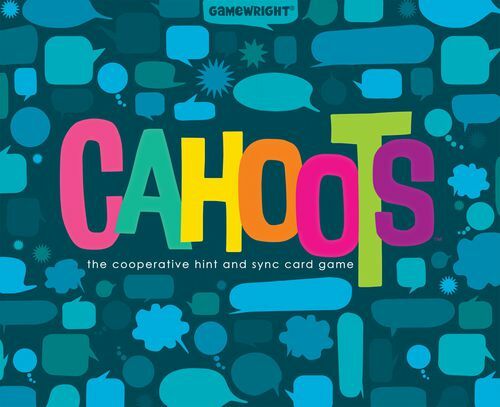 Cahoots is a fantastic little card game and one of my group’s favorite limited communication games. It’s a light game that feels familiar, but it’s also a unique experience that has been a hit with just about everyone I’ve played it with. It feels great when you’re able to play a card and complete multiple goals, and the close losses make you want to quickly set it back up and play again. It’s a simple-yet-clever design that should go over well with most crowds. If you enjoy playing limited communication co-op games like The Mind, Codenames Duet, The Ravens of Thri Sahashri, and Mysterium, you should definitely check this one out. 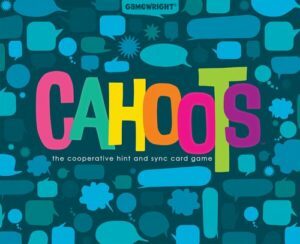 If you don’t like those types of games or you simply don’t want to add another light game to your collection, then Cahoots might not be for you. I know from firsthand experience that it works brilliantly as a pub game, and it should work just as well as a family game. Thanks for taking the time to read our Cahoots review! To stay updated on all things cooperative board games, follow us on Twitter, Facebook, or via RSS.